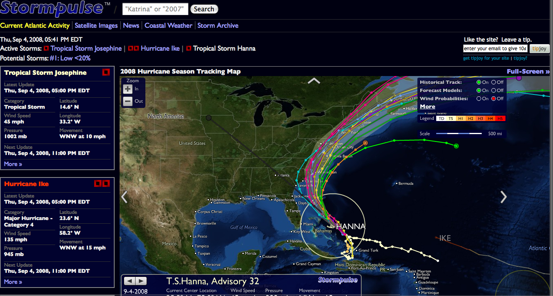 Wonder where Hurricane Ike will hit or when Tropical Storm Hanna will pass? Hurricane season has lots of people glued to the Weather Channel to catch the latest updates on developing storms. But why wait for the weatherman to tell you what is going on when you can check for yourself online? One of the best places to do that is Stormpulse. (Google Earth is another one). 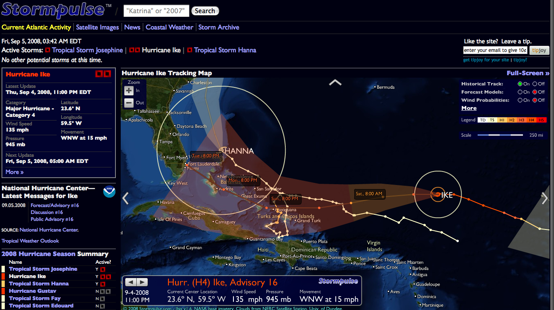 Stormpulse shows active hurricanes and tropical storms in the Atlantic. And the graphics are better than TV because you can play around with them. Data is pulled from the National Hurricane Center and other places. The site has storm data going back to 1851, soyou can see the paths and intensity of previous hurricanes. There is even an API for embedding Stormpulse maps on other sites.